Archaeology is undergoing rapid changes in terms of its conceptual framework and its place in contemporary society. 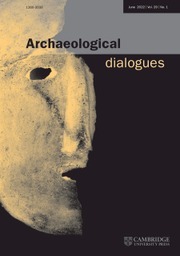 In this challenging intellectual climate, Archaeological Dialogues has become one of the leading journals for debating innovative issues in archaeology. Firmly rooted in European archaeology, it now serves the international academic community for discussing the theories and practices of archaeology today. True to its name, debate takes a central place in Archaeological Dialogues.